No more waiting and waiting and waiting each year for that magical moment when your boxes of Girl Scout Cookies FINALLY arrive. No more trying and trying and trying the rest of the year to resist the lure of those boxes you attempted to hide from yourself. No more praying and praying and praying you’ll forget the craving because you depleted your secret stash of Thin Mints and there are still months to go before they’re once again available. No more wishing for a homemade Thin Mints recipe, because here it is. Whew. 1. In a medium bowl, whisk together the flour, cocoa powder, baking powder, baking soda, and salt. In the bowl of a stand mixer or in a large bowl with an electric mixer, beat together the sugar and shortening (or butter) on medium speed until creamy and well combined, about 1 minute. (Just a heads up, if you’re using shortening, the mixture will not become light and fluffy as it does when you beat sugar with butter.) Reduce the speed to medium-low and add first the egg and then the egg yolk, beating well after each addition. Beat in the vanilla and peppermint extracts. Slowly beat in the flour mixture until just combined. The dough will be mad crazy sticky. 3. Preheat the oven to 350°F (177°C) and adjust the oven racks to the middle and upper third positions. Line 2 baking sheets with parchment paper. 4. Roll out the dough on the parchment until it’s 1/8 to 1/4 inch thick. Using a 1 1/2-inch round cutter, cut out cookies from the dough and place them 1/2 inch apart on the prepared baking sheets. Reroll any scraps and cut out more cookies. Freeze the cutouts for about 15 minutes. 5. Bake the Thin Mints, switching the baking sheets from top to bottom and front to back halfway through, until dry and crisp and firm around the edges, anywhere from 10 to 18 minutes, depending on exactly how thick they are. Use the first batch as a test batch. When the cookies cool, they should be crisp throughout. If they are not crisp, then they need more time in the oven. Let the cookies cool slightly on the baking sheets and then transfer them to wire racks to cool completely. 6. Meanwhile, in a double boiler or a heatproof bowl set over a pan of gently simmering water, heat 2/3 of the chocolate until it melts and registers 115°F on a candy or deep-fry thermometer. Stir in the remaining chocolate and let sit for 5 minutes, then stir to combine. Remove the pan from the heat and let the chocolate cool to 90°F (32°C). Submerge a cookie into the melted chocolate and turn to coat. Shake off any excess and place on parchment paper. Repeat to coat all the cookies, reheating the chocolate to maintain it as close to 90°F (32°C) as needed. Resist the urge to nibble the cookies until the chocolate has set, which will take at least 30 minutes. In theory, the cookies will keep, layered between sheets of parchment paper in an airtight container, for up to 1 week. Homemade Thin Mints Recipe © 2014 Silvana Nardone. Photo © 2014 John Kernick. All rights reserved. All recipes and photos used with permission of the publisher. This take on the famous Thin Mints cookie brought to you annually from the Girl Scouts is, in a word, UNBELIEVABLE. The flavor and texture are incredible. I found the finished dough to be soft but not at all sticky. Having little room in my refrigerator to rest rolled sheets of dough, I chose to roll the dough into a log about 2 inches in diameter. It worked perfectly. I then wrapped the dough tightly in plastic wrap and refrigerated it overnight. When it was time to bake the cookies, I simply sliced them a bit under 1/4 inch thick. I could not seem to find chocolate coating, so in its stead, I melted 14 ounces semisweet chocolate with 1 tablespoon vegetable shortening. It worked very well, hardened nicely, and had a beautiful sheen. Now that I have this MAGNIFICENT homemade Thin Mints recipe in my arsenal, I shall easily be elevated to a cookie god. Although trust me, there is enough room in the cookie kingdom for everyone! This homemade Thin Mints recipe really does replicate the taste of the iconic Girl Scouts Thin Mints. These are a bit chewier and moister, which I think is normal given that they're homemade and have fewer preservatives than "the real thing.” The mint flavor and the texture were delightful, and the chocolate coating really made them feel like Thin Mints. It’s worth noting that the first batch I made I did not coat in chocolate, but rather put a layer on top, and the full cookie coating made a huge difference in the flavor and similarity to real Thin Mints. This recipe is quite easy to follow and mostly true to the directions. A few things to note, however. First, I used regular white flour, not gluten-free. Second, the sugar and shortening mixture never got "fluffy" for me like it does with butter and sugar. Also, the dough was VERY sticky. I had to use a healthy coating of confectioners' sugar on the rolling pin and tabletop to be able to roll the dough out. I refrigerated the cookie dough overnight. When I took it out in the morning, the dough cracked easily. This did not end up being a problem, but I think it would be helpful to add to the recipe a note to bring the dough up a few degrees above your fridge to avoid cracking. This was a real pleasure to make and easy to follow. Every now and then, a recipe comes along that really grabs my imagination. The kind of recipe that, as soon as I make it, or even before I'm finished making it, has me thinking about 50 different variations, and wanting to get right back into the kitchen to start trying them out. This homemade Thin Mints recipe was like that. 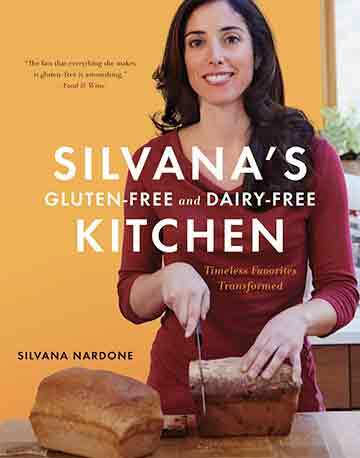 I used the author's gluten-free flour blend. This mixture is very close in proportions to some of the commercial gluten-free flour blends, so I think you could substitute your favorite store-bought blend without worries. I also used butter instead of shortening, since having the cookies be dairy-free was not important to me and I don't keep shortening in the house. The cookie dough was very sticky—far too sticky to roll out. I started out using confectioner's sugar to roll out the dough, but it became clear that I would have to use so much sugar it would change the flavor of the dough, so I switched to the flour blend. And instead of rolling it out to 1/8 inch from the start, I got it into a disk, and put it in the freezer for about 15 minutes, after which it was much easier to roll. After rolling and cutting out the cookies, the 2 baking sheets went back into the freezer for another 15 minutes or so before baking. This was sufficient to keep them firm, and they held their shape nicely during baking. I used Ghirardelli coating chocolate disks and found that 12 ounces was plenty to coat the whole batch of cookies with some chocolate left over. What to do with the leftover chocolate? Pour it on a piece of parchment, and sprinkle on some nuts, dried fruit, or coconut flakes, and let it harden into bark. Cook's treat! The cookies came out beautifully. I do think that I would increase the mint extract in the future, as once the cookies were coated with chocolate, the mint got overwhelmed. I'd also love to try other variations of this. For example, I think these would be great made with some orange extract and zest instead of mint. Or one could skip the cocoa powder, add some more flour, and flavor the cookies with lemon and coat them with white chocolate. The recipe seems to be pretty forgiving, and there are lots of possibilities to explore. 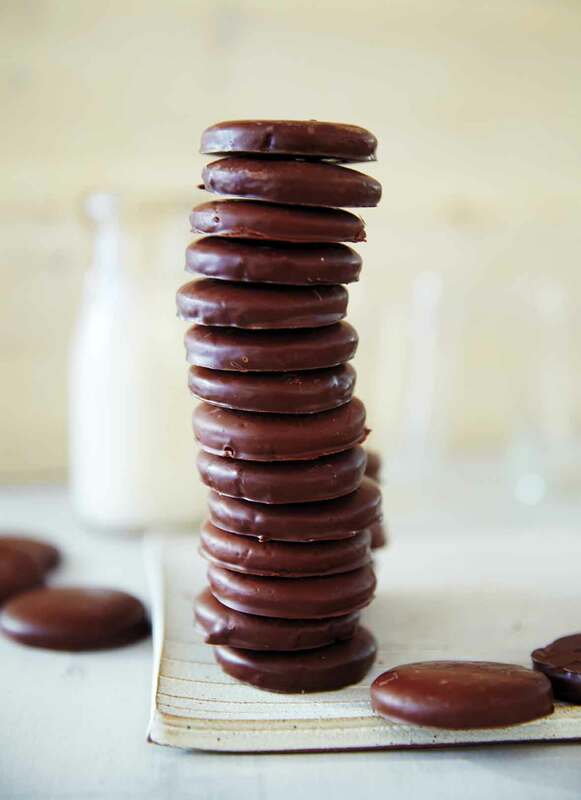 This homemade Thin Mints recipe was a true hit in our household. The cookies are very comparable to the Thin Mints we are all used to, but in my mind, they're even better—not as sweet and darker chocolate. This is a very easy recipe to follow. The only problem I had was creating a disk out of the dough, so I decided to refrigerate it for about 20 minutes, and I was then able to create the disk, as prior to that it was too sticky. After the dough was rolled out, the first batch stayed in the fridge for about 2 hours. The second stayed overnight. The baked cookies came out hard enough not to break apart when dipping in the chocolate. In terms of the melted chocolate, the temperatures worked beautifully. The hardest part was dipping. I guess it's a matter of experience, as my fingers were filled with melted chocolate! One thought I had for those who prefer less dark chocolate taste would be to use sweet chocolate for the melting portion of the recipe. This recipe will absolutely be a favorite for us here at home, but also as Christmas gifts, for parties, etc. For the last batch, I decided to melt semisweet and sweet chocolate to use on the cookies. My older daughter's comments were:" WOW... how did you do this? They're a cross between Thin Mints and Milano cookies. I LOVE them!" If making these gluten-free, should I use an all-purpose flour with or without xantham gum already added? Deni, good question. If you click on the link in the ingredient list to the gluten-free all-purpose flour mix, you’ll see that the recipe includes xantham gum, so my recommendation for a store-bought or other homemade gluten-free all-purpose flour mix would be for it, too, to include xantham gum. Love to hear what you think of the cookies! When testing this recipe I used the Gluten-Free All-Purpose Flour Mix. You can use any store-bought GF all-purpose flour, though I would advice to shy away from heavy mixes with beans. What I love about the one as per recipe is that it creates a light mix that works beautifully for cookies. Looking forward to hearing how you liked this recipe. These cookies are extremely addicting. Deni, the flour blend used in the recipe does have xanthan gum, but for this type of cookie, I feel confident you could use one without the gum and get equally good results. The texture you are going for here is a cookie that is crisp all the way through, not chewy, and xanthan gum doesn’t really help for achieving that texture. One place where the use of gums makes a difference in a recipe is the amount of water the dough absorbs, but this recipe has very little liquid in it, so that’s not really an issue here. The mix linked to in the recipe works great, but if you want to buy one at the store (and I don’t blame you! ), or prefer to avoid the gums, go for whatever is available or you have liked in the past, and don’t worry about it. The King Arthur mix is one I think would work well here, and it does not have xanthan gum in it. If you don’t use baking powder does it make a big difference? Jane, baking is such a precise science, I hesitate to recommend omitting something that usually plays a pretty critical role. We test each recipe before it goes on the site so we can guarantee you’ll have spectacular results. And I just can’t guarantee the results if you omit the baking powder. Chances are it won’t be a complete flop, but still, I think it’s worth a trip to the store just so make sure your time and other ingredients aren’t wasted. Sorry if that’s not what you want to hear! Wow theses cookies are fantastic! My family ate them up and said they tasted just like Thin Mints (really they do). The only problem I had was coating them in chocolate I found it tough to find a balance between having the cookie covered in a huge gob or not having enough on it. Any suggestions for proper cookie dipping techniques? Hi Laurel, was the chocolate running off the cookies when you first starting dipping, then globbing up later in the process? If so, it may be a function of the chocolate temperature. Very hot chocolate will tend to be runny while cooler chocolate tends to gob up. Keep an eye on that thermometer as a guide. Could you possibly use doTerra’s peppermint oil instead of the extract? Brandy, we didn’t test it that way, so we don’t want to hazard a guess. But if you do make it using the oil, let us know what you think. Yes, you can use peppermint oil to make these, i wouldn’t use quite as much as it says in the recipe though, as the oil tends to be strong. Hello, I made this recipe today and it came out very good. Only problem I had was with the dipping chocolate. It came out pretty messy looking, but taste wise they were amazing. Even my picky kids enjoyed them. Thanks for this delicious recipe.